Feeling discouraged? Need some inspiration? 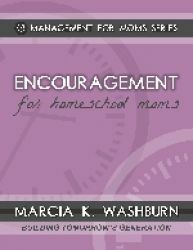 Encouragement for Homeschool Moms will lift your spirits and renew your courage. Filled with faith-building stories and encouragement for "those" days we all have sometimes. Just wanted to say that I'm loving your book, Encouragement for Homeschool Moms! I'm not even done with it yet but it's helping me change my perspective on so many things! My husband, five boys, and I live with my in-laws and I can't tell you what a blessing your words have already been to me! Thank you very much! If you are a mom, you have gone through those exciting and wonderful times that you are so happy to be a mom. But if you are a mom, you have gone through those down times and discouraging times that you wonder a lot of why things happen. This is a wonderful book to help encourage you and remind you how awesome YOU are! Marcia reminds us that we are special to our Creator and how to keep going even when things look dark. While reading this 55 page book, I shed some tears. It really spoke to me and reminded me that I was special to God and as the first sentence of the first chapter says, “You are God’s first choice as the mother of your children.” Wow, it doesn’t matter if they are ours by birth or by other means, He chose ME. You will find help and encouragement as you read through this wonderful book! As promised in the title, this book was such an encouragement to me as a homeschool mom! I was reminded that I am God's FIRST choice as the mother of my children, and that He is able to be strongest and show Himself faithful in the times our family is facing challenges or I feel simply inadequate. God knows who I am, what I need, and when I need it--and I can trust Him! The personal stories and examples Marcia shares in this book prove this to be true! Reading this will warm your heart and move you toward loving action!